Use Quick search for all fields within Patent, Design and Trademark. The hits are presented in three lists, usually with the trademark hits first. Choose the tabs for Patent and Design to view these hits. For more precise hits, choose Advanced search. Note! Searches may only be conducted in Norwegian. The database does not separate between upper and lower case letters. You will get hits regardless of what you use. The database does not have automatic truncation. For example, Bottle will not show hits on Bottles. Example: sykkel* (bicycle*) shows hits on sykkel (bicycle), sykkelramme (bicycle frame), sykkelsete (bicycle seat), etc. - as well as the field "Text in Mark" in Advanced search. A search with only one character followed by * is often too heavy and returns an error (example: a*). See the guidelines for truncation for each search field. It is not necessary to add logical operators like AND, & or between each word. If you are looking for hits on one of the words in a search phrase, you can add OR or | between the words. To exclude hits with particular words and expressions you may use the logical operators - or NOT in front of the word you want to exclude. Example: sykkel* (bicycle*) NOT holder (rack). This will show hits on everything starting with sykkel (bicycle), unless it contains the word "holder" ("rack"). Be aware of this if you search a word containing a hyphen. Such words must be searched as a phrase (see below). Use NOT as last operator if searching with NOT in combination with AND and/or OR. NOT can't be used as the first word in a phrase. 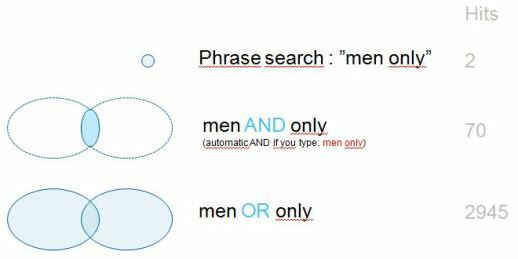 Two or more words in a specific order must be searched as a phrase: " ". Example: "Ford Fiesta". To search words or expressions containing special characters like $, %, -"price, $1,24" you must use "...". The search will ignore special characters inside the quotation marks. Consequently, searches like "Up&Down" and "Up-down" will show the same hits. please note that in Advanced search for trademarks (the field Text in mark) a different set of rules applies.. There are 5 search fields in Advanced search where the general search principles do not apply. These are application number (all fields), patent number (patent) and registration number (trademark). In these search fields only truncation (wildcards) can be used. Logical operators &, |, -, and can be used only between words or in search phrases. The operator ? is not allowed. Please note that in Advanced search for trademarks (the field Text in mark) a different set of rules do apply. The search hits are prestented in three lists, usually with the trademark hits first. Choose the tabs for Patent and Design to see these hits. To see a detailed view of one of the hits, click the application number. Figures in the hitlist can be enlarged by simply clicking on them. To minimize the Figure, simply move the mouse pointer away from the figure. Applications/registrations prior to March 2004 usually lack the Figure in the database. If you need the Figure from these applications they have to be ordered from the Norwegian Industrial Property Office. If no Figure is shown, click the column "Show columns" and check the box to indicate that you want this column to be visible. The default sort option is the Filing date shown in descending order. You may sort the hitlist by clicking the headline of the column you wish to sort by. The current sort option is indicated by an arrow; click the arrow or headline to change between ascending and descending order. The hitlist can be expanded by more columns and has powerful sort options. Under "Columns (grey button)" you can define which columns (fields) you want to see. Check the box in front of all columns you want to see. The view settings are saved for the rest of the search session. You can also prioritise the columns. If you want to sort by owner, and then filing date, check the box for both these columns. Choose "sort priority" 1 for the owner and "sort priority" 2 for the filing date. The hitlist will show the owners in alphabetical order, whereas the applications are presented chronologically. Close the function by clicking the tab at the top. Choose the number of hits to be shown per page of the hitlist. If you usually work within a particular field, you may choose which hitlist to be shown for quick searches. By choosing the option "remember my preferences...." it will not be necessary to re-enter the setting each time you visit our online search facility. Close PREFERENCES by clicking the tab at the top or the blue cross. Choose the file type by clicking the "Export to..." link. You decide which columns you want to export under "Columns". Note: only the first 2000 cases will be included in the exported file. Close the function by clicking the tab at the top or the blue cross. To see a detailed view of one of the hits (in the hitlist) click the application number. In the detailed view a menu on the left hand side will quickly direct you to the desired information. For example "Payment" which lets you know whether the renewal fees have been paid. The detailed view automatically generates a unique url which includes. To share: just copy the url into an e-mail. For more detailed information, use the i-ikons on the page. Mark or word in a mark. Shows hits on the exact word/words you search. Combine search words using OR to hit only one of the words. Use * to replace one or more characters. Example: sol* shows hits on sol, solo, solis etc. Example: "sol i hjertet" ("sun in your heart"). You can start a field with * (truncation replacing several characters). In your search you can use some special characters WITHOUT using a search phrase. A special character which also has a function as an OPERATOR must be placed in a search phrase (if you wish to search such characters as part of a trademark). Example: "sol-" or "play win"
Word mark in standard font (text only). Text and device or purely figurative mark (combination of word/text and graphic elements or only graphic element). Colour per se mark (one colour or a combination of colours). Three dimentional mark (shape of goods). Hologram (three dimentional photo, appears different from various angles). Sound mark (a particular sound as distinctive mark). Olfactory mark (a particular scent as distinctive mark). Motion or multimedia mark (marks containing a movement). Taste mark (particular taste as distinctive mark). Format: yyyynnnnn (year serial number) (Applies after 1998). 1976-1998 there were four digits after the year. Before 1976 (with few exceptions) only serial numbers (nnnnn) were used. The format åååånnnnnA may occur. The letter A explains that this application is divided from the original application. Example: type 2005* to search all registrations filed in 2005. Applicant and/or owner of the registration or application (name or firm). Use " " to search a specific combination of words. Example: "Unos papirindustri" will only show hits on Unos papirindustri. The hitlist gives you the sort option to separate between applicant and owner. You cannot start the field with * (truncation replacing several characters). Format: nnnnnn for national registration number (nnnn or nnnnn for older cases). Format: nnnnnnn for international registration number. Add 0 in front if the number contains only 6 digits. The format nnnnnnnA may occur. The letter A explains that this case is divided from the original case. Shows hits of exact registration number. Person or enterprise representing the applicant. Use * to replace one or several characters, and _ to replace one character. Use "..." to search a specific combination of words. You can not start the field with * (truncation replacing several characters). Tip: Check which classes your competitor has chosen protection in! Indicates the classes for which the trademark applies. There are 35 classes for goods, and 10 for services. If you want to search one or more classes at the same time, you have to use OR: (1 OR 2 OR 25). to search one class, but exclude another (9 NOT 16). To find the correct class, try the interactive classification assistant (button to the right of the search field). Example: Legal status: Under prosecution. Detail status: First official action. You can search for trade marks with acquired distinctiveness. It is possible to tick only this box and find all relevant cases. Date span when an application was received in the Norwegian Industrial Property Office. Date span the case was granted and registered at the Norwegian Industrial Property Office. For the case type "International registration designating Norway" this search field equals to the date of international registration. Use the Published field to get an overview of cases that have been published as registered(national) or granted(international) in the Gazette. It is recommended to use this field in combination with the field "Case type". Date span when the application was published in the Trademark Gazette. Opposition period is counted from the publication date. The Trademark Gazette is published every Monday. Priority number applies if priority was claimed in the case from an earlier application/registration outside Norway. The country code indicates where the first application was filed. Format: nnnnnn(space)countrycode 586118 CH or just nnnnnn. A list of the country codes can be found here (www.wipo.int/standards/en/pdf/03-03-01.pdf). This field can also contain just *, if you want to find all applications with priority. Date when the first application was filed. Responsibility mark: goods made of gold, silver or platinum that are fitted with a purity standard. 6ter: marks containing state emblems, official responsibility marks and emblems of intergovernmental organizations, etc, which are covered under Art. 6ter of the Paris Convention). The Madrid Protocol is a system for the international registration of trademarks, of which Norway is a member. These registrations are also referred to as "Madrid incoming". This selection covers all Trademark applications and registrations having been filed or registered directly in Norway. In other words, this option covers applications and registrations from all over the world not using the Madrid Protocol path. A number is assigned to all marks containing figurative elements. There are 29 classes with several subclasses. Example: 26.03.17 triangles containing one or more numbers. Add 0 in front if the number contains only one digit. Use * (truncation) if you want to search main classes (less than six digits), for example 02.05*. If you want to search one or more classes at the same time, you have to use OR: (02.05.23 OR 02.05.21). You may use AND or space to only show hits on registrations that include all classes (02.05.23 02.05.21). Use NOT to search one class, but exclude another (02.05.23 NOT 02.05.21). Case number in an appeal case to the Board of Appeal of the Norwegian Industrial Property Office, KFIR. Newer cases from KFIR are registered in the format VM yy/nnn, D YY/nnn or PAT yy/nnn. I the time periode ca 1987-2003 cases are registered with a four digit number (nnnn), ca 2003-2010 in the format BOA000nnnn, ca 2010-2013 in the format yyyy/nnnnn. This field may contain only * (truncation). If you want to find all applications that have been appealed to the Board of Appeal. You should fill in at least one additional search field, but may experience that the search takes some time. Name of the individual or enterprise that has filed an opposition against a registration. Use * to replace one or more characters, and _ to replace one character. Use "..." to search a specific word combination. This field may contain only * (truncation) if you want to find all applications against which an opposition has been filed. A holder granting another party the right to use the trademark, patent or design commercially. Use "..." to search a specific word combination. Example: "Unos papirindustri" shows hits only on Unos papirindustri. It is voluntary to submit this information to the Norwegian Industrial Property Office, so the information may not be complete. This search field may contain just * (truncation) if you want to find all applications in which a licensor is registered. Your should fill in at least one additional search field, but may experience that the search takes some time. An individual/enterprise that has been granted the right to use another party's trademark, patent or design commercially. This search field may contain only * (truncation) if you want to find all applications in which a licensee is registered. which are based on national applications or registrations (data available from 2005). Please note that an international application may be based on several national applications / registrations. It is possible to subsequent designate contracting parties of the Madrid Protocol at a later date than the time of the original international application. The date identifies when Norway was subsequently designated. Indicate a time period using From date and To date if you do not have the exact date. A list of the country codes can be found at WIPO . Product name or word in product name. Give hits on exact word/Words. Note: Norwegian applications use Norwegian terms, interntional applications use English terms. Combine with OR to show hits on one of the words. Example: _ol shows hits on sol, pol, bol, etc. Use "..." to search a specific word combination. You can not start a field with * (truncation replacing several characters). Format: 0nnnnn for national registration number (add 0 to five digit numbers). Format: DM/nnnnnn for international registration number. Use "..." to search a specific word combination. Example: ols* shows hits on all names starting with Ols (Olsen, Olsson, etc). Example: Per Arne Olsen (specific word combination). Lists the classes for which the design applies. There are 32 classes with subclasses. "nn-nn" (quotation marks MUST be used). If you want to search one or more classes at the same time, you have to use OR: ("02-02" OR "02-05"). You may use AND or space to only show hits on registrations that include all classes ("02-02" "02-05"). Use NOT to search one class, but exclude another "02-02" NOT "02-05"). Date or date span when the application was published in the Design Gazette. The Design Gazette is published on Mondays. International design registrations designated in Norway, via the Hague system. This selection covers all design applications and registrations filed directly in Norway. A holder of a registration granting another party the right to use the trademark, patent or design commercially. From 2015 both Norwegian and English language is permitted. Please use both languages in you search (sykkel OR bicycle) to find all relevant hits. You can not start the search field with * (truncation replacing several characters), but it is possible to start with _ (truncation replacing one character). Note: Use the free text field to search for "EP application number"
You can not start a search with * in this field. (truncation with several unknown characters). A list of the country codes can be found at WIPO . The search tool located behind the input field helps you to this page. Use "¿" to search a specific combination of words. Indicates in which classes the patent has been classified, according to IPC and possibly CPC. CPC is based on IPC, but is more detailed. NIPO has used CPC from 20 October 2015, in addition to IPC. Classes in bold describes aspects with the invention. Classes in normal type describes other aspects of the patent. Click classification code to see the text corresponding to the code. Explanation: Date span when annual fee is due. Check the box to search for divided and/or separated applications. You should fill out at least one additional serach Field, but still may experience that the serach takes some time. These are documents that the examiner in the Norwegian Industrial Property Office has cited as prior art, after examining and prosecuting the patent application. You can choose to search a particular right within patents (example Supplementary Protection Certificate or European patents/validated EP patents). Format: yyyynnn This search field may contain only * (truncation).